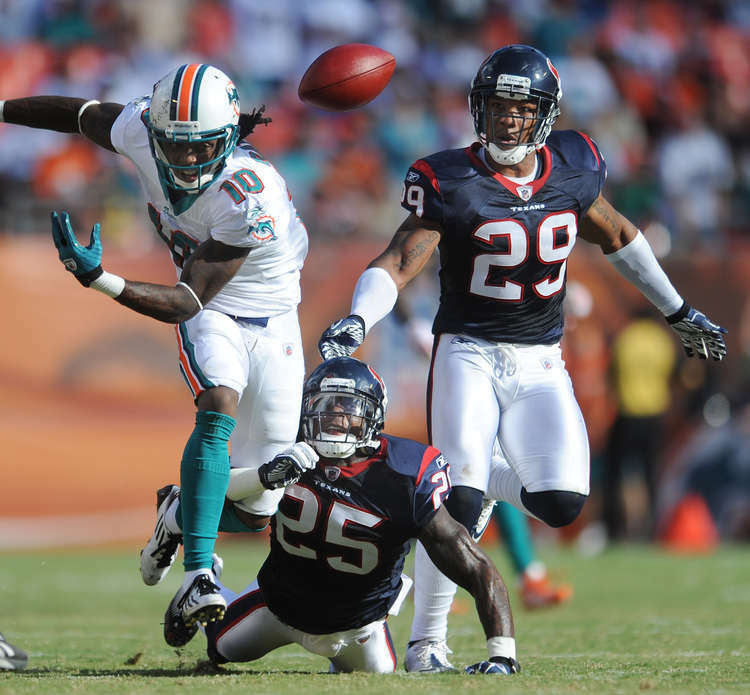 The “Hard Knocks” team of 2012, the Miami Dolphins, are looking to change their image with new coach Joe Philbin, and Sunday they kickoff 2012 with a matchup vs the AFC South champs from 2011, the Texans. Miami is a young team with a new starter at QB in rookie Ryan Tannehill. The rook was so-so in the preseason, but with trying to get him into the fire right away, Philbin went with him over Matt Moore and David Garrard as the starter. Not many people feel Miami will be that competitive in 2012, and with good reason. They have a weak WR group, the defense has flaws, and Tannehill looks at times like a fish out of water. It all adds up to a long year coming for Miami. Sunday they will rely on RB Reggie Bush to give them a boost on offense, but it won’t be easy. Bush has said he feel he can go for 2000 yards this year, but seeing what he’s going up against, getting even 60 is going to be tough. With Bush in check, the pressure shifts to Tannehill, which is not good news for Miami. Houston will look to lower the boom on him and the Fins offense, and with J.J. Watt, Brian Cushing and company, it looks to be a long day for sure for the Dolphins. The Houston offense will center around their running game with dynamic Arian Foster, and usually at home he shines, and will again Sunday. Foster will go over 100 as he will have plenty of running room. Matt Schaub won’t have to throw much, but look for him when he does to test a Miami secondary that underwent a shift this offseason with a trade of former first round pick Vontae Davis. Houston will get off to a quick start, take advantage of a few Miami mistakes, and be in cruise control by the third quarter as they easily take home this week one matchup. Dolphins at Texans – Who Wins This Week 1 Game?